Gases can be modelled as small particles (representing the molecules or atoms of the gas in question) flying about in all directions. (This simplified model is called an ideal gas.) As these particles strike the walls of their container so they exert a force on the container pushing it outwards. This force per area is the pressure exerted by the gas. 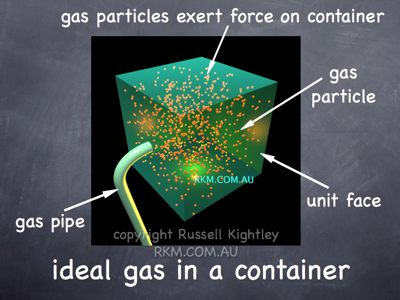 This animation shows gas particles being introduced into a cubic container to illustrate the concept. If the dimensions of the cube are unity then the force on a wall represents the pressure of the gas. At about the middle of the animation the gas is heated (glowing lights) causing the gas particles to speed up (temperature is a measure of the kinetic energy of the particles). These particles are shown turning red to emphasise the point. These hotter, faster particles strike their container with more force than the slower cooler ones did, and so they increase the pressure. This explains why gas pressure increases with temperature (if the volume stays the same).